The image was acquired with the Optical Navigation Camera - Telescopic (ONC-T) of the Japanese Hayabusa2 probe. Credit: JAXA, Tokyo University, Kochi University, Rikkyo University, Nagoya University, Chiba Institute of Technology, Meiji University, Aizu University, AIST. The red frame corresponds to the photograph taken at an altitude of 1000 metres. The image was acquired with wide-angle optical navigation camera (ONC-W) of the Japanese Hayabusa2 probe. Scientists and engineers have been waiting nearly four years for the Japanese Hayabusa2 spacecraft – which is carrying the Mobile Asteroid Surface Scout (MASCOT) lander that was developed and constructed by the German Aerospace Center (Deutsches Zentrum für Luft- und Raumfahrt; DLR) – to reach its destination: the asteroid Ryugu. With the approach and arrival having taken place on 27 June 2018, the landing is now within reach. The MASCOT mission will mark the first time that a scientific laboratory, equipped with instruments, aims to land on an asteroid. Based on current planning, this is expected to take place in the first week of October 2018. At the moment, the Japanese space agency JAXA is using the Hayabusa2 space probe to carry out instrument readings with the goal of achieving a more accurate assessment of the asteroid’s gravitational force. This information is also a major variable influencing MASCOT’s landing. MASCOT will conduct measurements in more than one location on the asteroid’s surface. In the process, it will make autonomous ‘decisions’ and operate the corresponding instruments. In an interview, project leader Tra-Mi Ho from DLR’s Institute of Space Systems tells us how the team is preparing the MASCOT lander for its mission, how its tasks will unfold on the asteroid and what risks lie ahead. This interview was conducted by Manuela Braun. The asteroid Ryugu was still more or less unknown territory when MASCOT was launched on 3 December 2014. Now, Hayabusa2’s camera has observed the asteroid from a distance of six kilometres. To what extent can this information help the team to prepare themselves – and the lander itself – for the landing? We are getting a feel for it to an ever-increasing extent. However, much of this information is still being evaluated, so we will confer – in two stages of discussions on 14 and 17 August 2018 – about the best place to land. We do know that we cannot have MASCOT landing on the higher latitudes, meaning on the asteroid's poles. And because the Hayabusa2 probe will lower itself onto Ryugu to collect samples of asteroid material, there are inevitably restrictions for MASCOT, which must not obstruct the sample collection process. Based on the first evaluation of data, however, there is no shortage of interesting regions in the middle latitudes. Photos already available clearly show that the asteroid is scattered with large boulders and also has craters on its surface. What repercussions will this have for the landing? We are not worried about the craters – we can even land there. We currently perceive no challenges from topographical issues. However, there are other criteria, such as Ryugu's physical characteristics, which we must consider. For example, the thermal conditions on the asteroid. If MASCOT heats up too much, there will be problems. The instruments can only work at their best within their intended operating temperature ranges, otherwise the data will be excessively noise-laden. Again, the battery will suffer if temperatures are either too high or too low because it would dangerously overheat or lose usable capacity. MASCOT's landing and operation on the asteroid are being repeatedly tested and optimised through simulations. What must the MASCOT team know about the asteroid Ryugu in order to prepare the lander for its mission in the best possible way? The Japanese space agency JAXA is currently taking gravitational readings of the asteroid. So we are waiting for precise figures on Ryugu's gravitational force. Gravity will affect how MASCOT bounces and this will influence the final position at which the released lander comes to rest. As I said, information on the asteroid's thermal characteristics is also crucial. That is still lacking and is being examined at the moment. Another important aspect is the size of the rocks on Ryugu. A certain size of rock could cause MASCOT to get stuck. So every piece of new information about Ryugu makes the MASCOT mission more concrete and easier to plan. What has the MASCOT team already been able to achieve in terms of adjustments and making decisions? In our last simulation, for example, we found that for long hops – meaning if we take hops of more than 10 metres – a great deal of time would be lost through the bounce phase until MASCOT comes to rest again. However, that period of time is important because our operating life is only going to be 16 hours. We also have to remember that MASCOT will still have to upload its data to the Hayabusa2 probe. 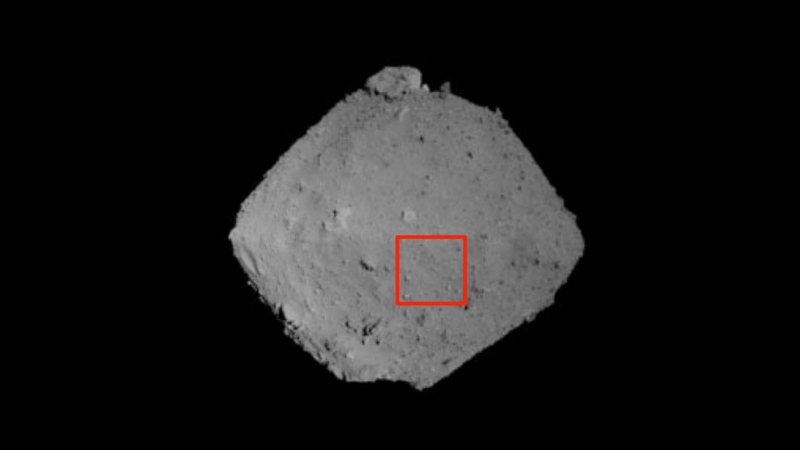 From a scientific viewpoint, it also appears that Ryugu’s composition across the surface of the asteroid does not vary much. We certainly don’t need long hops in a bid to find something more interesting at a measurement position much further away. Accordingly, our hopping distance will be between one metre and a few metres. What are people here on the ground working on in laboratories or on their computers in order to ensure that the landing itself and the scientific tasks proceed smoothly and fully automatically? The first concern is to determine the right place to land. For us, as engineers, it is important that the thermal conditions should be right, but secondly there has to be a suitable place for MASCOT to land where the transition from day to night on the asteroid is favourable. The significance of night, after all, is that we cannot see anything from Hayabusa2, and consequently we cannot upload any data or store it on the probe. And just now, we are in the process of establishing the operational sequences for MASCOT. The lander will operate autonomously on the asteroid, and it must be robust enough to work with these sequences in order to carry out the scientific tasks. In the process of the mission, it will be MASCOT that decides how and when it initiates these sequences. The lander has its own integrated autonomy manager, which will determine when MASCOT has come to rest and is then able to begin with its readings. Does this mean that MASCOT has to make decisions completely independently? Yes, it does. MASCOT has to make decisions on its own. However, we have engineered it with ‘time-outs’ that will set certain limits. In the event that MASCOT makes the wrong decision because – for example – the information coming from sensors is not ideal, then it will nevertheless start work on its readings once a specific period of time has elapsed. We do not want to lose any time unnecessarily. The landing is planned for the first week of October 2018. What is this dependent on, and how certain is that time frame? The specific date is dependent on various criteria. The landing will take place in coordination with the operation of the Hayabusa2 space probe. The probe must descend towards the surface of the asteroid in the process of separating from MASCOT, and then has to eject the lander at a certain point in time and at a specific point in space. The landing site also has repercussions for our time planning. And, of course, there is a team checklist: There may be error messages, meaning that we have to land at a later point in time. However, this depends on how serious the error message is and what steps can still be taken in order to rectify the error. There is also a 'point of no return', meaning a point in time after which we can no longer interrupt the landing. And at the MASCOT control centre in DLR's Microgravity User Support Center (MUSC), there is a ground model of MASCOT that is used for continuous testing. What is the limit date by which MASCOT's configuration changes have to be completed before release into space? The final possibility will be during September until a relatively short time before the landing, probably around two weeks before MASCOT is ejected for landing. We will be uploading sequences right up until then. The final parameters can still be uploaded before the actual landing process is initiated. We have also just completed a health check and switched on instruments and subsystems. As expected, the lander's state of health is nominal. We will have two more contact opportunities with MASCOT before the landing takes place. We are planning these specifically for the selected landing point. 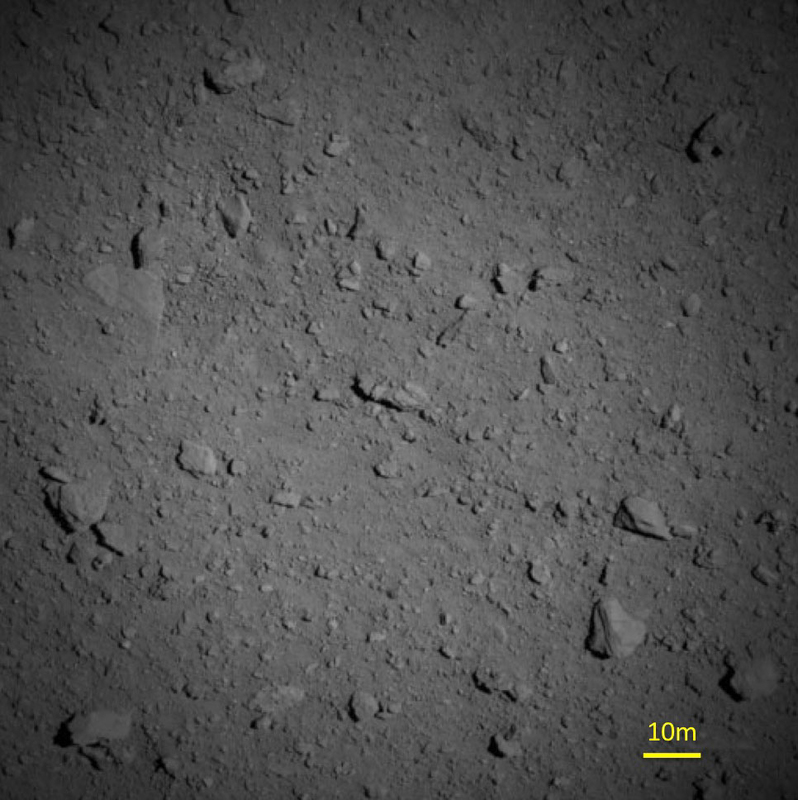 The photo of Ryugu from a distance of just six kilometres was the team’s first close-up insight into where MASCOT is to land and operate. What was the reaction? Ultimately, I was relieved that it was not a celestial body like the comet 67P/Churyumov-Gerasimenko, on which Philae landed in November 2014. At least Ryugu is more consistently formed than 67P. Of course, we had qualms on seeing all those rocks – together with concerns about whether it would all be too challenging for MASCOT. What would be the worst or the most hazardous thing that could happen to MASCOT during the mission? The worst would be if MASCOT failed to separate – meaning if it just got stuck in the Hayabusa2 probe. Or if the lander could not right itself on the asteroid's surface, either because it gets stuck between rocks or lands on a very soft substrate. Of course, these are the two main scenarios that concern all of us. But once MASCOT comes to rest and we have received the first signals, and once we know that it has already taken some readings in freefall, we will experience a great sense of relief.